These premium double poly 12oz. Colored Paper Frozen Yogurt Cups are perfect for frozen yogurt, ice cream, and gelato. You can even place stickers on these Frozen Yogurt Cups to personalize them. Lids sold separately. 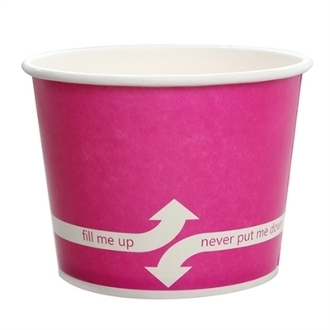 States "Fill Me Up, Never Put Me Down" along the frozen yogurt cup.